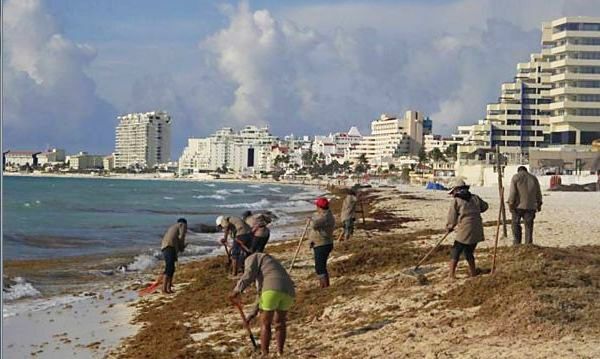 Authorities in Mexican state of Quintana Roo say they have already gathered up more than 22,000 cubic meters of sargassum in Cancún alone, and predict it will continue for some months to come. Quintana Roo, Mexico - If you were thinking about vacationing in the Caribbean this summer, you might want to think again. The much larger than normal volume of seaweed, which has turned beaches all over the Caribbean from pristine white to coffee brown, just keeps on coming. The algae is part of a family called Sargassum and it is carpeting beaches in tourist hot spots like the Dominican Republic, Barbados, Trinidad, Tobago and Mexico's Yucatan Peninsula. Clumps of sargassum seaweed have long washed up on Caribbean coastlines, but researchers say the algae have exploded in extent and frequency in recent years. There are various ideas about what is causing the seaweed boom that scientists say started in 2011, including warming ocean temperatures and changes in the ocean currents due to climate change. Brian Lapointe, a sargassum expert at Florida Atlantic University, says that while the sargassum washing up in normal amounts has long been good for the Caribbean, severe influxes like those seen lately are "harmful algal blooms" because they can wipe out fish populations, foul the beach, harm tourism revenue and even cause coastal dead zones. Here in Mexico, efforts to remove the foul-smelling seaweed from the beaches of Quintana Roo continue. Authorities in the state say they have already gathered up more than 22,000 cubic meters of sargassum in Cancún alone, and predict it will continue for some months to come. One official said that it will take about $9.1 million and 4,600 workers to clean up the seaweed mounds accumulating along Mexico's Caribbean coast. Part of the money will be used to determine whether the sargassum can be collected at sea before it reaches shore. The Cancún and Puerto Morelos Hotels Association are anxiously awaiting the results of the study because the region's most important tourism fair, the Cancún Travel Mart, is scheduled to take place in early October, and the big winter tourist season is just around the corner. Association president Carlos Gosselín Maurel said the hospitality industry stands to lose as much as 20% in tariffs and occupancy if the seaweed problem isn't resolved before October's tourism fair.